If someone were to mention dunes in the Mojave Desert, Death Valley’s Mesquite Dunes at Stovepipe Wells would come mind first for some people. The Kelso Dunes might even come up. There are more dunes out there that in lie outside of the National Park and Monument boundaries, you just need to look a little further. With all the dry lakes out there the sand has to blow somewhere. 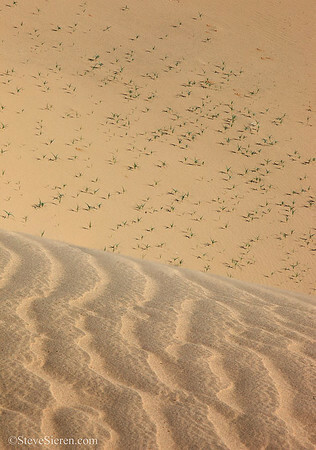 Some dunes fields are extremely small and others such as what is shown here are significant in size. 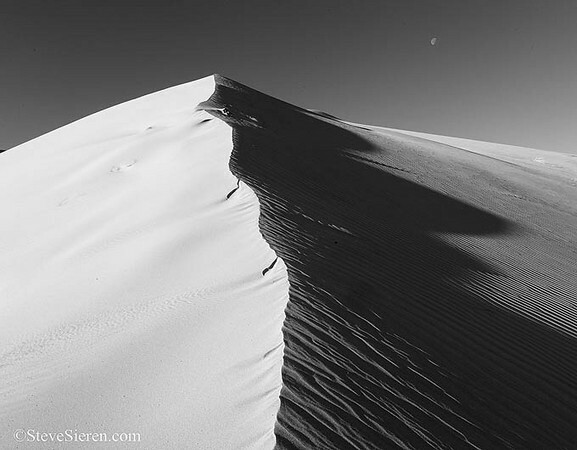 Many dunes are similiar and usually can be identified with the mountain back drop if there is one. 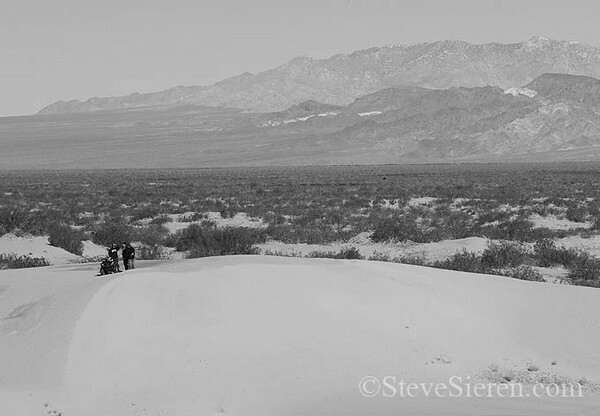 These dunes are designated wilderness where people may seek desert desolation but I have come across people ignoring the desigated wilderness boundaries with OHV use. I can imagine how dificult it can be trying to protect something out in the middle of nowhere. It would be nice if there were signs posted with violation fee amounts in all parking areas near wilderness areas. 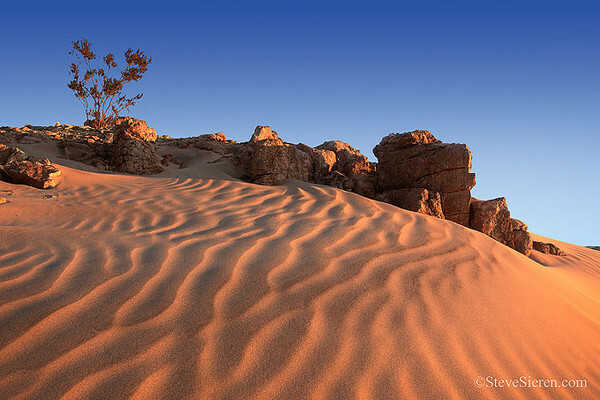 Frost covers the dunes during winter in the early morning. Sometimes solitude comes with no foot prints. If anyone is interested in a private or small group workshop between the late fall and early spring please email me via the contact page on my website. This entry was posted on August 2, 2010 at 10:37 am and is filed under Uncategorized. You can follow any responses to this entry through the RSS 2.0 feed. You can leave a response, or trackback from your own site. 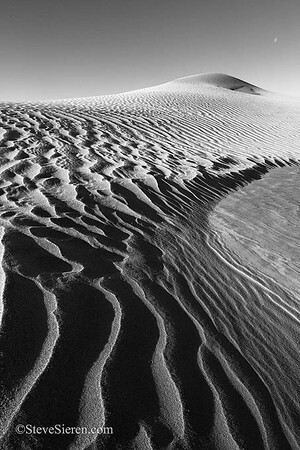 I love dunes and your 4th and 5th photograph are very fine. I like what seems almost like a reverse negative effect of the foreground in the 4th image with the widely distributed plants in back. That photograph is unusual and a bit otherworldly. Beautiful series Steve, we don’t get to see much black and white from you. 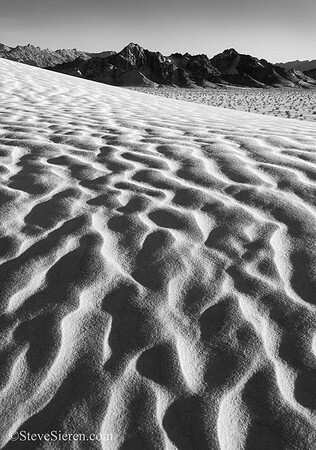 It’s a nice change and brings out the texture and shape in the sand dunes. I would love to know where they are?? You probably didn’t announce the location for a reason. Anyhow it is upsetting to see the OHV use in a designated wilderness. Makes you wonder what can be done to protect the area further. Love the candy (and vivid) colors of the first one. Derrick, I don’t see any candy here so maybe you can elaborate on what you’re talking about. David, I used created that image using a focus stacking method. I’m more in love with the angle of view then I am with the result. Kind of leaves a mysterious gap between the foreground and background for me. Sometimes these compressed views defy the laws of physics. My eye couldn’t see that much depth of the field when I was there. Jenny, Rick Daley would say color is the enemy of shape. I don’t do much black and white work, I usually save it for when the color image lacks impact for me. I think you have a great photograph if it works in both color and black and white. Of course not all of them do that. I doubt those kids were fined out there. I came here to catch some untouch dunes and I’m glad the dunes were not full of OHV tracks.